GLOBAL AWARENESS 101 - Let your VOICE be heard and get involved. OUR future depends on it! : GUINEA: BSG Resources Still Hopes To Regain Guinea Iron Ore Mine Despite Legal Strife. A Lot Of Very Interesting Drama Surrounding One Of The World's Largest Untapped Resource. 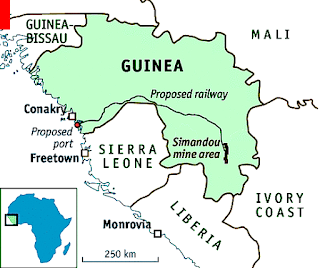 GUINEA: BSG Resources Still Hopes To Regain Guinea Iron Ore Mine Despite Legal Strife. A Lot Of Very Interesting Drama Surrounding One Of The World's Largest Untapped Resource. Mining group BSG Resources still hopes to one day regain a disputed iron ore deposit in Guinea despite years of legal wrangles. The group, owned by Israeli diamond magnate Beny Steinmetz, believes it can develop the Simandou project in the West African country even though it was stripped of its licence in 2014 amid allegations of bribery. 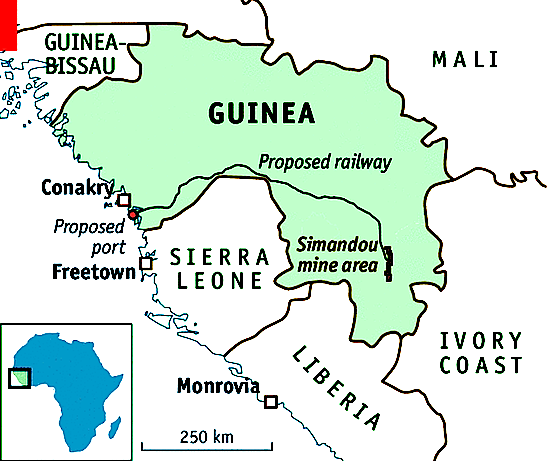 Mr Cramer suggested that working with the Guinean government “would not be an obstacle” despite the two sides preparing to begin an arbitration over Simandou in Paris next month, which is expected to uncover more details about the long-running struggle to develop the mine. Simandou is one of the world’s largest untapped resources of high-grade iron ore, used to make steel, but its location in the interior of the impoverished country has made it difficult and expensive to exploit. The licence to develop the mine was originally held by FTSE 100 group Rio Tinto, before it lost half of the concession to BSGR in 2008. The Israeli firm then struck a controversial $2.5bn deal to partner with Brazilian giant Vale to develop its half of the project, but lost its rights after a new government came to power and accused it of bribing its way into Simandou. Mr Steinmetz is being investigated by authorities in three countries over bribery, and was briefly placed under house arrest in Israel last year. No charges have been brought, and BSGR has always denied wrongdoing. The company’s arbitration at the World Bank’s International Centre for Settlement of Investment Disputes begins on May 22. If BSGR is successful, it could result in a ruling ordering that its rights be restored. It comes as Mahmoud Thiam, Guinea’s minister of mines between 2009 and 2010, is expected to stand trial in the US next week on charges of bribery in a related case. Meanwhile, BSGR has launched a $10bn (£7.8bn) damages suit against American billionaire George Soros, an advisor to Guinea’s government since 2010 [Interesting revelation (emphasis mine)], accusing him of staging a defamation campaign that resulted in it losing the Simandou licence. “Soros was motivated solely by malice, as there was no economic interest he had in Guinea,” BSGR said, adding that his “illegal conduct destroyed” the group’s investment in Guinea. Mr Soros’s spokesman has called the allegations “frivolous and entirely false” and a “desperate PR stunt meant to deflect attention from BSGR’s mounting legal problems across multiple jurisdictions”. BSGR has also threatened to sue Rio for multibillion-dollar damages over Simandou, alleging that it had a “central role” in bringing about its loss of mining rights. Rio has said it will defend itself “robustly”. The Anglo-Australian miner is caught up in a bribery investigation of its own, after leaked emails appeared to show that senior executives approved a $10.5m payment to a French banker in Guinea in 2011, apparently in exchange for his services in helping it reclaim half of its rights to Simandou. The miner has reported itself to authorities in the US, the UK and Australia. Rio has since sold all of its interest in the deposit to Chinese group Chinalco. Mr Cramer said BSGR had once tried to work with Chinalco on Simandou, and said there was “an opportunity to put Humpty Dumpty back together”. BSGR’s original plans for Simandou involved reviving a train line built by Swedish engineers in the Sixties to deliver the iron ore south through Liberia to Buchanan.